Stonehedge LLC's homebred Well Defined earned a chance to compete in the Breeders' Cup Juvenile after a win in the Florida-bred Stakes at Gulfstream Park, but wound up finishing 12th after an awkward start and being checked at the five-sixteenths pole. The 3-year-old gelded son of With Distinction came back in January to run fifth in the Mucho Macho Man Stakes, also being brushed at the start in that spot. This Saturday, the Kathleen O'Connell trainee drew an outside post, breaking from hole nine in the 10-horse field. He broke on top and jockey Pablo Morales guided him to a frontrunning three-length triumph in the G3 Sam F. Davis Stakes at Tampa Bay Downs. Well Defined completed 1 1/16 miles over the fast main track in 1:42.70, earning his first 10 points on the Road to the Kentucky Derby. After the gelding broke sharply, Morales let him steal away to a four-length lead heading into the clubhouse turn. The first quarter mile went in a sharp :23.23, but then Morales eased Well Defined off the gas slightly to mark the half-mile in :47.09, a split of 23.86 seconds, and then three-quarters in 1:11.68, a split of 24.59 seconds. Favorite Knicks Go tracked the leader from second, closing the gap to two lengths down the backstretch, but never fired when asked at the head of the lane. Kentucky Wildcat ran an impressive race from off the pace, making a big move around the far turn and sweeping into contention. With the mid-race breather, however, Well Defined had more than enough left to kick on to the wire. He cruised under the finish about three lengths ahead of runner-up Kentucky Wildcat, while late-running So Alive, last early on, nosed out Counter Offer for third. Knicks Go faded to finish fifth. “This horse has a ton of natural talent and I was going to take advantage of that,” Morales said. “I wasn't too worried about where I was going to be because we were really lucky with the draw position on the outside, so I figured I was going to ride a cool race. The horse is naturally fast and has a super-long stride. I was going to come out running, but if somebody wanted to take the lead, I was OK with that. All I wanted to do was ride a cool and collected race and keep my horse running. Bred in Florida by his owner, Well Defined is out of the unraced Medaglia d'Oro mare Fru Fru. He won at first asking, then ran third in an allowance race before trying stakes company. Second in the Affirmed leg of the FTBOA Florida Sire Series, Well Defined won the next leg by an impressive 7 1/2 lengths. Overall, the gelding has won three of his seven starts for earnings just shy of $500,000. 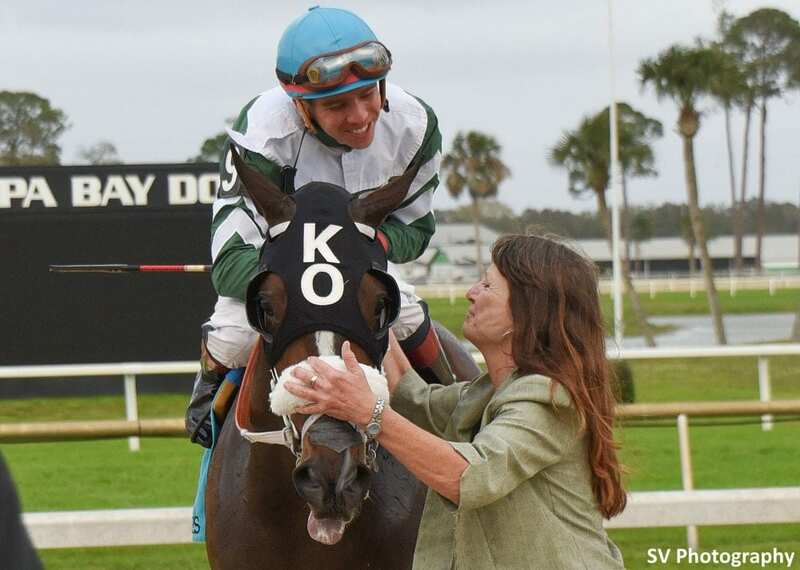 This entry was posted in NL Article, Triple Crown and tagged FTBOA Florida Sire Stakes, kathleen o'connell, pablo morales, road to the kentucky derby, Sam F. Davis, tampa, tampa bay downs, well defined, with distinction by Paulick Report Staff. Bookmark the permalink.